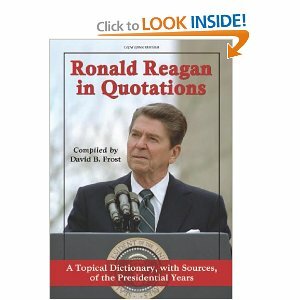 Ronald Reagan in Quotations: A Topical Dictionary, with Sources of the Presidential Years by David B. Frost is what it says it is, a collection of quotes from the eight years Reagan was President. This is a collection of over 2500 quotes from speeches and other public addresses that were delivered in person or via TV and / or radio. Frost purposefully did not select documents that were released by the Office of the Press Secretary. And does not provide any commentary on the quotes cited. This leaves the reader to use their own interpretation. The book is arranged alphabetically by more than 70 primary topics (with some subtopics). A few of the topics include Abortion, Berlin Wall, Constitution, Environment, Family, Freedom and Liberty and Unemployment. Frost even includes quotes that showed Regan’s human (& sense of humor) side with the topic Reagan on Reagan. There are multiple quotes where Regan makes fun of his age. Each quote is assigned a number that is referenced in the books index. The index includes a full list of topics (additional topics not on primary topics are listed in the index) people, and places mentioned in the quotes. Each quote is cited with the date given along with the venue. With the topical format and indexing it is easy to quickly locate a quote regarding a specific topic, event or about a specific person. This is an important resource for any Reagan fan, historian, blogger or public speaker needing to reference Regan quotes. Frost has done a great job in collecting a vast cross section of the words by the “The Great Communicator,” President Ronald Reagan.